Surprises can be sweet. I’ve talked a bit about surprises before — about how I’m kind of in the middle, loving to surprise other people but enjoy being “in the know” myself. before I pick up the phone. Well, it’s that time of year again — prom season. After Spring break, I look forward for my entire school going on hold for all of the brief interruptions that break up the otherwise monotonous day. littering the floor of the forum is a wonderful thing. A Cappella groups bursting into song in the middle of a math quiz? Yes. Boys flying in the air holding prom posters? Double yes. A lot has changed since my mom was in high school. Most boys don’t just call a girl up and ask her to prom like they used to. It has grown into a big production, and as the years go by it gets harder and harder to think of something that hasn’t been done before. Some boys will even go so far as to wear gold sparkly booty shorts and twerk on their high school crush until she says yes. For those of you who need a refresher on what “twerking” is, look no further than the link above. Anyways, I’m somewhat glad that I’m not a boy who has to worry about thinking of something clever, funny, entertaining, and original every year. Sometimes, it’s nice to let yourself be surprised. Which brings me to this recipe. 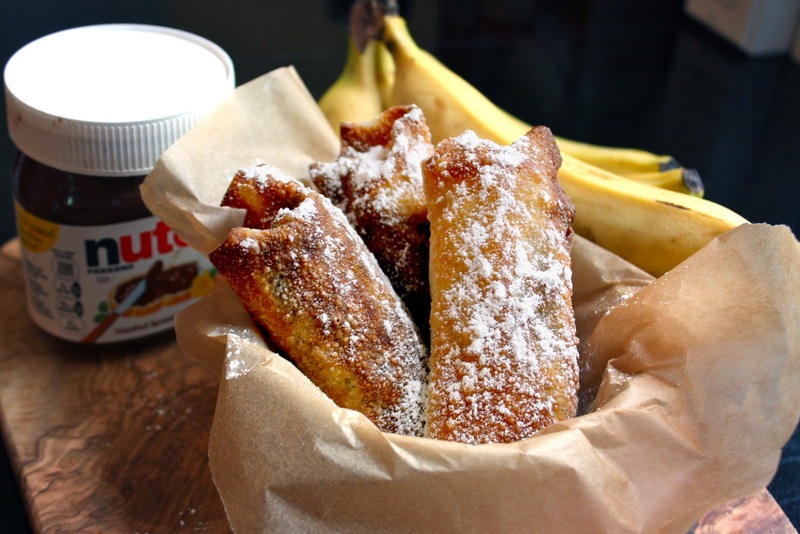 Banana Nutella Eggrolls. 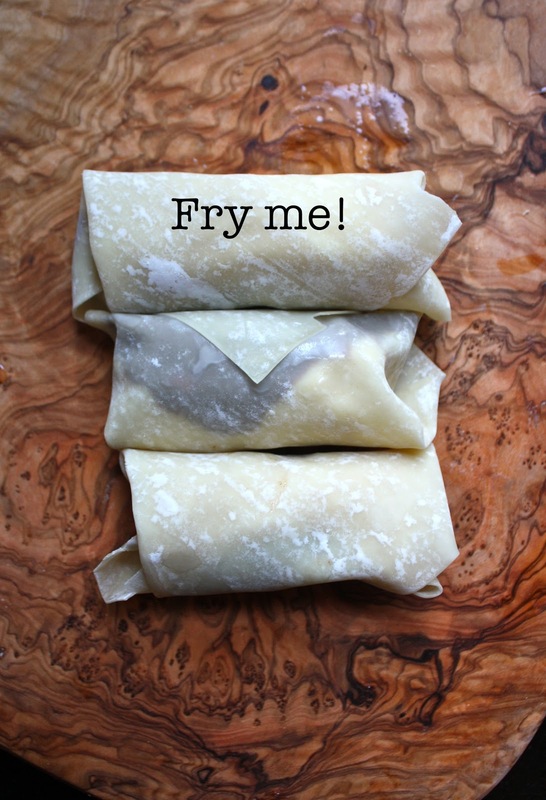 Deep-fried Asian cuisine on the outside, and sweet, classic crepe fillings on the inside. 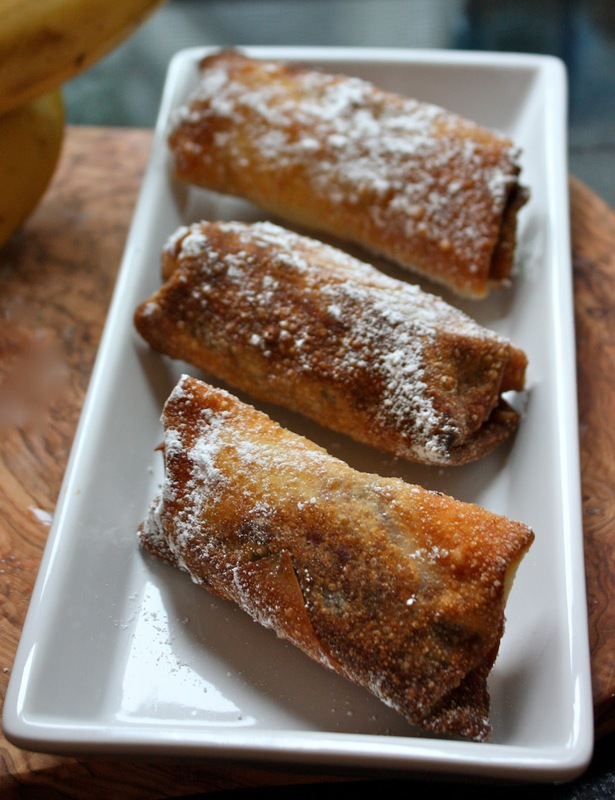 You think you’re in for some shredded cabbage, pork, and eggs (classic egg roll fillings), but then BAM, you bite through the crunchy deep-fried crust to discover nothing but caramelized banana covered with oozing, melty Nutella. Mindblown. This is what happens when I’m at home alone for too long with leftover wonton wrappers. Maybe that should happen more often. 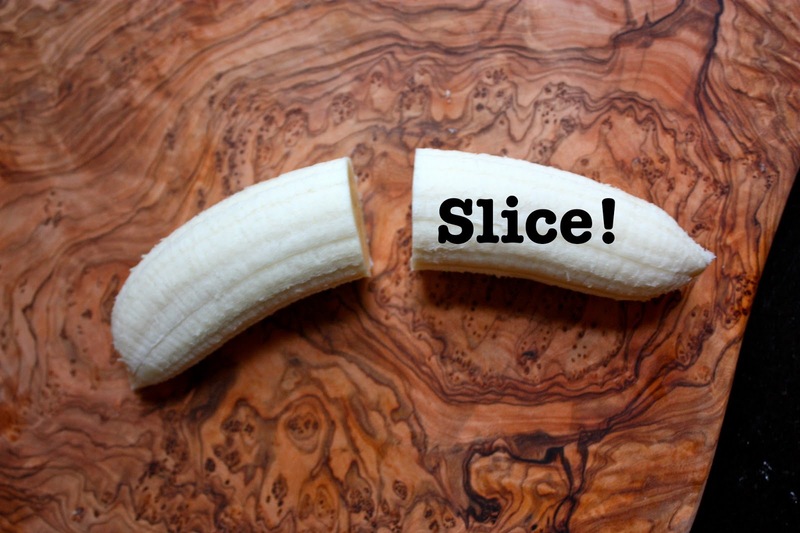 Slice all of the bananas in half. 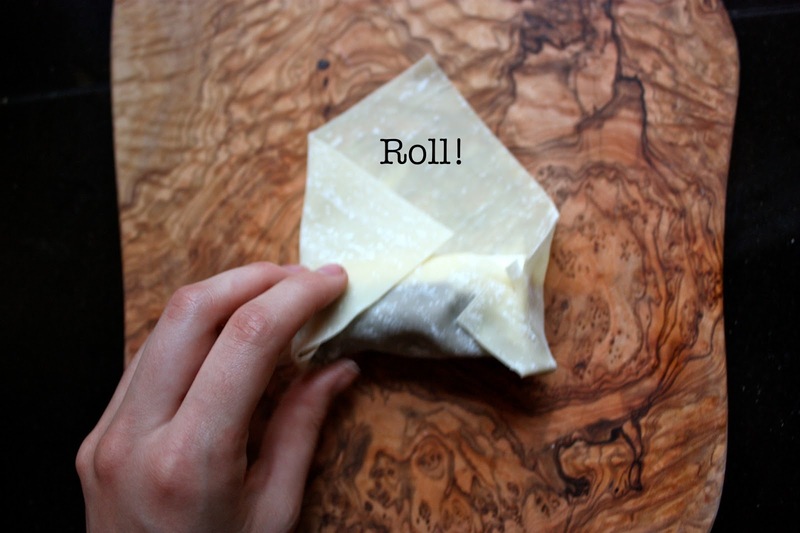 Lay out a wonton wrapper like a diamond. 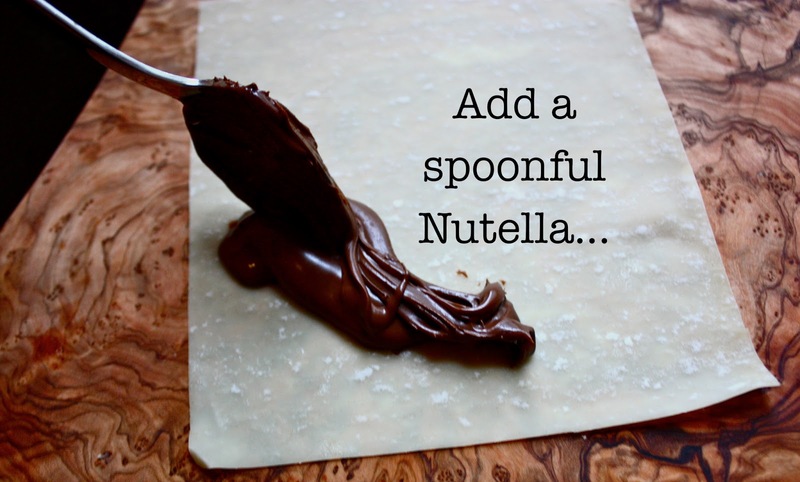 Spread a spoonful of Nutella lengthwise (see image). 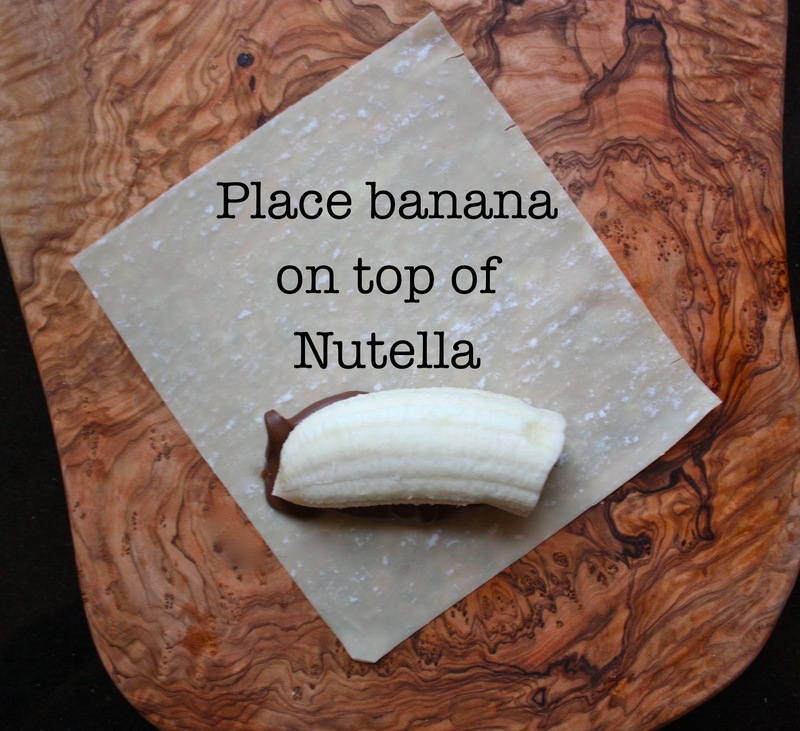 Place a banana half on top. Roll burrito-style. Seal with water. © Cannella Vita. All images & content are copyright protected. Please do not use my images without my permission/linking back to Cannella Vita. If you want to republish this recipe, please link back to this post. Those of you who follow me on Instagram know that I am Instagramming 24/7 — updating you all on my socks, my dog, and my new nail color. From now on, I’m also going to Instagram my spontaneous culinary creations so that I can share them with you all before I forget. We just got back from vacation a few days ago, and the kitchen is still quite sparse. We had egg whites, quinoa, and a bunch of frozen veggies. Fried rice brings back elementary school memories for me. My mom would make it for me at least twice a week with salami and egg. That flavor combination will always have a special place in my heart. Today, I made a healthier and more grown-up version of this childhood favorite of mine. I replaced the white rice with quinoa and replaced the salami and egg with vegetarian sausage patties, egg whites, and a ton of green veggies. 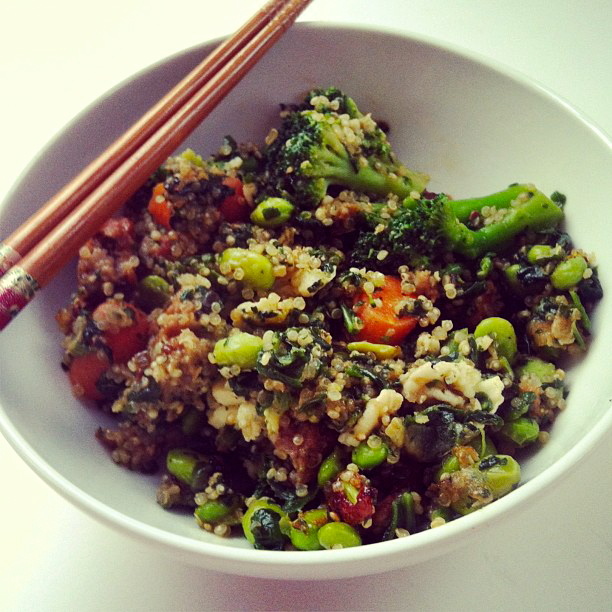 This lunch packs a ton of protein from the quinoa, egg, sausage and edamame, and a ton of vitamins from all of those green veggies — so it’ll keep you feeling strong all afternoon! Add the quinoa and water to a small saucepan and bring to a boil. Once boiling, reduce to a simmer and cover. Cook for 12 minutes, and let stand for 5 minutes. In the meantime, put the sesame oil into a large frying pan and cook the egg whites. Once set, add the saugsage patties and all of the frozen vegetables. Cook until everything is defrosted. Add the cooked quinoa and stir. Season with the soy sauce, ginger, garlic powder, and curry. Cook on medium-high heat for 5-10 more minutes. Enjoy! It’s a fried flower, for god’s sake. It must be delicious! During the late summer months, I always leave the Farmer’s market with a little basket of these delicate flowers. I always see people scratching their heads at what to make with this “exotic” flowers. What do I do with them? Fry them of course! 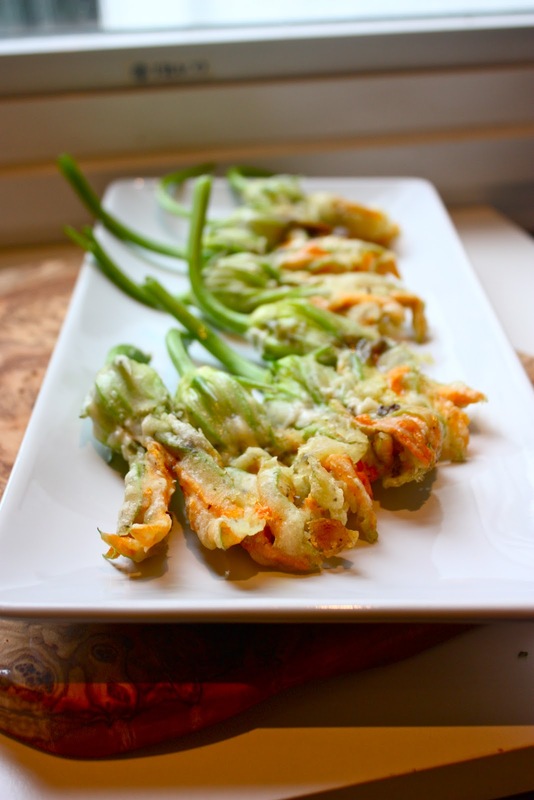 All summer, zucchini and other squash blossoms are fried all over Italy — sometimes stuffed with a bit of cheese. The delicate flower is encased in crispy, golden breadcrumbs, oozing with melted cheese. The immediacy of this dish makes it quite beautiful — the epitome of summer cuisine. Fresh from the market, quickly cooked in rich olive oil, and devoured. These are best eaten straight out of the pot — even over the pot if you wish ;). Be careful, as they are quite perishable, and should be eaten the day they are bought. Please try your best to savor these last, beautiful moments of summer. Fill a small saucepan with 1-2 inches of oil. Heat over medium high heat (to 350 degrees if you have a thermometer). Pick over and remove stamens from blossoms. Set aside. Whisk eggs in a bowl. Mix flour, salt and pepper. Dredge blossom in flour, then egg, then flour. plate. Let cool slightly before serving. Today, I was in the mood for some appetizers. I was just at home, trying to perfect the art of doing nothing before school rolls around. At lunchtime, as I stared into my every day, refrigerated quinoa salad… something inside of me was yearning for some deep-fried-one-bite-fancy-little-finger-foods. Behold the samosa. I enhanced the mushroom flavor with some luxurious truffle salt. Samosa is a stuffed pastry that is popular in Southern Asia. It is a fried, triangular pastry with a savory filling; such as potatoes, onions, curry, lentils, or ground meat. Today, I filled my samosas with diced mushrooms and onions sprinkled in curry powder. Mushrooms are the perfect filling for vegetarian samosas if you don’t want to sacrifice the meaty taste. I fried up six of these for lunch — just for me. Since the recipe makes a lot, I folded all of the other samosas, put them on a plate in the fridge, and fried them up for dinner. If possible, these really must be eaten right out of the fryer. These would be perfect for a dinner party, or any occasion where hors d’oeuvres are needed — such one of the last lazy afternoons of summer. Sautee the mushrooms, onions and olive oil in a pan until soft -- sprinkle with curry powder, salt, and pepper. Cut the spring roll wrappers into 3 inch wide rectangles (I cut each of mine in half the long way). Cover it with a damp cloth while working with it so it doesn’t dry out. Holding the rectangular pastry at the middle, take the bottom left corner and fold it towards the right into a triangle. Then take the bottom corner of the triangle you just formed and pull it upwards towards the left into another triangle to form a cone. 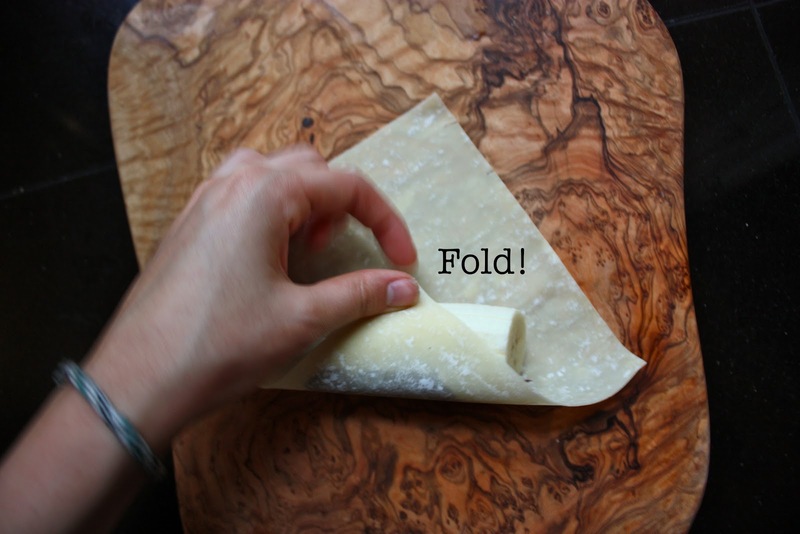 Fill about 1 tbsp of filling into the triangle and pressing it down with your finger. Once you fill the cone, take the bottom left corner up towards the right side. Dip your finger in water and press to seal. It’s important that the samosa is completely sealed so oil doesn’t seep into the filling while frying. If you see any openings close it with more water. Heat oil in a wok and drop the triangles in it. They are done when light golden brown.